West Country Rivers. – Dirty wet dog , boats and sailing. This years cruise is taking on a definite flavour and that being the beautiful wooded west-country rivers from the Helford river in the west via the Falmouth and Fowey rivers and all the way east to to Salcombe and Dartmouth. I of course didn’t start logically at either one end or the other but almost in the middle with my home base being the tidal Tamar at Calstock. If anything the Tamar is the odd one out as although it has a few sections that are wooded and ‘wild’ its mainly bordered by farmland and reed-beds whereas most of the west-country rivers are wood lined : as of easter and our cruise up the Helford river i noticed that a lot of the oak that lines the river is only just in bud so the trees still look grey and dull. Tremayne quay in the Helford river. As of easter we hadn’t yet got up to the head of navigation at Gweek quay , neither had we got into the larger creeks lower down. Our main focus so far has been the rivers above Falmouth , so far we have mainly been in the Fal and Truro rivers with just a quick look at some of the creeks but with several to go yet. Our usual anchoring spot in the Fal. And later the same day. Channals creek just below King Harry ferry : great anchorage in the Nor-westerly breeze we had although the Truro harbourmaster thinks its ok to charge boats for anchoring overnight there….on their own tackle…! Cornish Shrimper beating up the river : nice boat the Shrimper but just a bit small inside for me. The Fal/Truro at this point does still have some ship moorings and both a survey vessel and a crane barge were on moorings during our time there. During my most recent trip i explored the Fal river into ruan creek, it was grey throughout so not a good bet for photographs : instead i beached the boat on hard sand and gave her a scrub and then went for a walk around the creek. Its easily possible to walk ashore at that point as its firm sand right up until a short muddy section close inshore, one side is supposed to be a deer park and early that morning i spotted a roe-buck and a couple of his females. Later in the same trip i sailed up to Malpas and into the Tresellian river up to St Clements and had a very quiet night at anchor there. 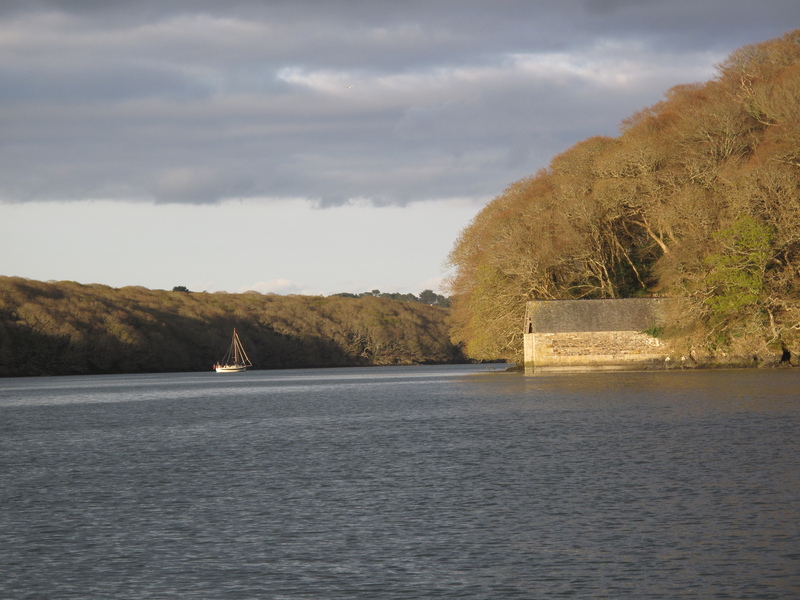 The next river east is the Fowey river where it divides at Golant : i have already posted about beaching the boat there but here it is again and during the trip home. My home river is the Tamar and as i write my boat is back at base while i do a quick early summer refit. During my trip home i had to sail up the river due to an engine problem and it turned out to be one of the nicest light wind ghosting trips i have ever had. I am going to post about that sail in a specific post but i hope that for here it just gives a flavour of my home river : it feels surprisingly wild and open when compared to the wooded rivers further west. There is a steeper sided and woody section further up but mainly after the tidal weir at Gunnislake which i plan to canoe and film sometime soon. I have got to know the river in all seasons now, above Weir Quay there are few boats until my base at Calstock and always somewhere to anchor away from the summer crowds. My favourite anchorages are just below Pentille castle in deep water and secondly upstream of Calstock but not quite as far as Morwhelham quay. Out of season i often go up to Dandy hole in the Lynher but that gets far too popular and busy in the summer so my more escape is to go up into the lynher river itself opposite St Germans. Very nice, the rivers look really cool to cruise on.